When severe weather strikes, the NWSNashville relies on people on the ground to tell them what is happening/what has happened. Note: we are not part of the NWS. We are simply volunteers that do this to help keep each other safe during severe weather. We relay any important info to NWSNashville if and when warranted. The NWSNashville has spent a lot of time creating and giving storm spotter classes to anyone interested in Middle Tennessee during the spring and fall severe weather seasons. These classes are held in different locations and are free and open to the public. They teach you how to storm spot and what to look for, so you can be a trained storm spotter during severe weather events. It is always encouraged for people to take a storm spotter class to become a trained storm spotter. Check out our list of local storm spotter classes for Hickman County that are given by NWSNashville. The more trained spotters are out there, the better NWSNashville knows what’s going on and can issue warnings as necessary. While being a trained storm spotter is encouraged to help provide the most adequate, timely, and accurate information, some storm reports do come in from the general public. Those that are not trained storm spotters can still let NWSNashville know what is happening and what has happened. The most important thing is your safety. Only report things if and when you are safe to witness them. Hail compared to the size of a coin. If possible, take a picture of the biggest hailstone you can find next to a coin that is the closest size. You can also measure with a ruler (or take a picture of it with a ruler) as well. If you can’t do either, estimate the size based on common objects (pea size, ping pong ball size, golf ball size, baseball size, etc.). Wind damage. Damage to structures (homes, storage sheds, barns, commercial buildings, etc. ), trees down, and downed power lines are all important to report. Again, pictures of the damage is preferred, but not required. Flooding. Extensive flooding that is occurring in an area that should not be inundated in water. Most important: water covering roadways, in homes, or in an area that is a risk to the public. Tornados. If you see a tornado, get in your safe spot immediately. These are often reported by trained spotters, EMS, and local law enforcement. If you do happen to see a funnel cloud or tornado, please report that as well, including the direction in which you were looking. Snow/Sleet/Freezing Rain: During the winter, if you see any of these occur, please report this as well. The NWSNashville wants the above information. In addition, they want to know your approximate location (i.e. 3 miles north of Centerville), the time the event occurred, and what you saw. Pictures are a great bonus. Often, NWSNashville will issue a call to action for trained spotters. One of those call to actions often sound like this. We also post these to our daily posts when we see them. MORNING AND WILL LIKELY BE NEEDED SATURDAY AFTERNOON AND EVENING. One of the best ways the public can report the above events to NWSNashville is through Twitter using #tspotter. Include your location, what you saw, the time you saw it, and a picture if possible. 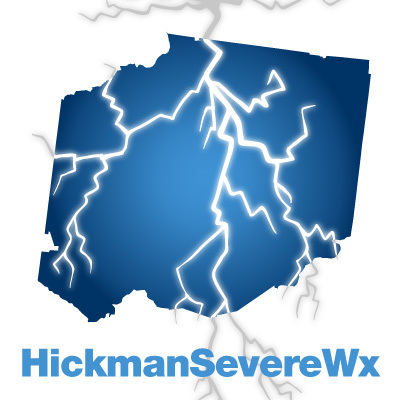 You can also tweet us the information directly to us on Twitter at @HickmanSevereWx and we can clarify and/or relay information back to NWSNashville.